The testing call is now closed. Thank you so much for your support! The Paro Cardigan pattern is now available in the shop. Happy new year! I hope you had a wonderful break and are ready to rock and roll in this sure-to-be-amazing year! For me, I can’t wait to jump into a new pattern. Actually this Paro Cardigan was ready for testing before the holiday, but who wanted to test during such busy time of the year? But now, let’s get started! Would be you interested in testing this sewing pattern? I made three Paro Cardigans for myself, and I have been wearing them everywhere. In fact, I am wearing one as I am typing here. I love that it is feminine and gives me a care-free feeling. Plus, it also covers my behind (sometimes I just like more coverage). Primary fabric Use medium weight knit fabric with 10% to 25% stretch. Sweater knit, ponte and other double knit are great choices. Choose a size smaller if your fabric has more than 25% stretch. Contrast Fabric Optionally, you can use a contrast fabric for the waistband and band. Choose a fabric similar in weight and stretch as the primary fabric. A contrast fabric is not necessary if you want to use only one fabric for the garment. Interfacing Four (4) pieces of 2” x 2” (5 cm x 5 cm) lightweight knit or tricot fusible interfacing if a button is used. No pattern pieces are available. I plan to start testing Saturday, January 7th, and would like to receive your modeled photos with your garments by Sunday, January 15th. But as always, if there’s any important change to the pattern, we’ll extend testing as needed. Please only apply if you are interested in the style of the pattern. You will not have the opportunity to modify the style of the pattern (though you may choose to do so at your own time after the testing period). If you like your garment any other way, please forgo this testing call and wait for the next style that interests you. You are expected to choose a size based on your body measurements and sew the pattern as written for the purpose of testing. Blending sizes (from bust to waist to hip) and lengthening/shortening are OK. The chosen testers will be invited to private Facebook groups where we can discuss the pattern, share pictures and discuss revisions. I will send the invite/link to the email that you provide. So please make sure you enter the correct email in the application form. Also please make sure that I am able to view the sample photos you submit; if I am not able to view your photos (i.e., viewing requires special permission that I do not have), then I will move onto the next application. Too bad I saw this too late, it looks like the cardi pattern I am looking for ! Hi Anne, it’s not too late. 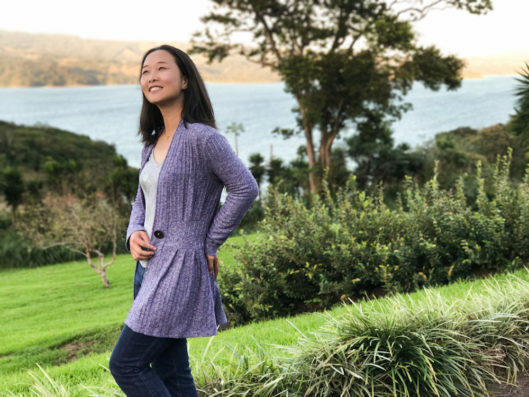 The Paro Cardigan pattern is now available. I love it! Looking forward to purchasing this pattern when you release it! How do I get the pattern??? Hi Carol, testers who finish the test and upload photos will receive the final copy of the sewing pattern. However, this testing call is closed now. Testers have been selected. You can watch out for more testing calls in the future. Usually the spots go really fast from announcing to selecting (1 or 2 days). Can I just buy the pattern when testing is done??? I am way too slow a sewer to be a tester. Will buy this pattern when released as it looks fabulous. Also no time to test – but I will absolutely be looking for this pattern once it’s published!!!! Love the look – very flattering and fresh. I can’t test as I don’t do Facebook but I can’t wait to buy the pattern. Beautiful! Sadly I’m too busy for testing but I look forward to making one after it’s released! I’m not a good tester candidate, but I can’t wait til this pattern is available. I have the perfect fabric for it. a perfect trans seasonal piece! I can’t wait to buy this pattern – wow, it is beautiful. Sorry, no time to test it this week or next. Gorgeous- love the details on this!